And for our last installment of NoCoPoMo (for this year, anyway, it was so much fun I might have to repeat next year!) we have: Incredibly Mediocre Shredded Chicken! Woot! At least Nate has been eating the leftovers of this, so it must have been better than the pulled pork from week 1.5 that has been sitting in the freezer. I thought it was good when we ate it, but apparently after some distance and consideration it was decided to be “not good.” I think it’s just a barbecue sauce preference. This recipe was for tostadas, but I just made the chicken, then we mushed together our own tacos. I didn’t think there was anything special about the chicken, but it made good taco stuffing! It’s nice to mix it up from the ground beef every so often. Combine chili powder, lime juice, jalapenos, hot pepper sauce, and garlic in slow cooker. Add onion, top with chicken. Cook on low heat for 5-6 hours or high heat for 2 1/2 to 3 hours. Remove chicken and onion from cooker; reserve 1/2 c cooking liquid. Pull chicken into shreds. Combine chicken, onion, and cooking liquid in bowl. I didn’t take any pictures because shredded chicken doesn’t actually look that appealing. Use a different cookbook – I feel like I cooked from the one cookbook all month. I have many others, and most of them have slow cooker sections. It’s just so convenient when the whole book is devoted to the slow cooker! Use my Dutch oven, which I think is what I would cook a lot of my slow cooker recipes in if I wasn’t using the slow cooker. That should be doable. The “challenge” for this month was to pack lunch every day. Nate usually takes leftovers and I don’t usually leave the house, so, that will be easy. Unless I actually get a job, at which time this whole cooking thing will probably collapse in on itself. I’ve had a pretty busy past few days – two whole busy days in a row – and we ended up going to Sonic last night. Fail. I have to say we have been eating very well since we got all our stuff back. We were eating pretty well in our one-bedroom without our stuff, too, but it was a lot harder to make meals and I had to plan what food would cook in which of our one pot, one pan, one baking sheet, and, eventually, one baking dish. But basically anything was better than in Cincinnati where we barely ate at home at all. Weeks two and three of NoCoPoMo were full of good food and LEFTOVERS. My favorite. Really. Leftovers means you don’t have to cook some nights or that there are lunches ready to eat. And using the crock pot means there are always leftovers. It’s hard to find a crock pot recipe for two people. Week 2 we feasted on Beth’s Crockpot Sausage Lasagna. It was delicious, and got better the longer it waited in the fridge. I don’t usually make lasagna with sausage, but I think it will become a permanent addition. I used one hot sausage and one mild sausage (because the meat counter didn’t have any medium) and it worked out perfectly. Now, my favorite part of lasagna is the crunchy over-baked noodles on the sides of the pan, so I don’t think I will always make my lasagna in the crock pot, but it certainly was easy and a great way to feed a bunch of people! 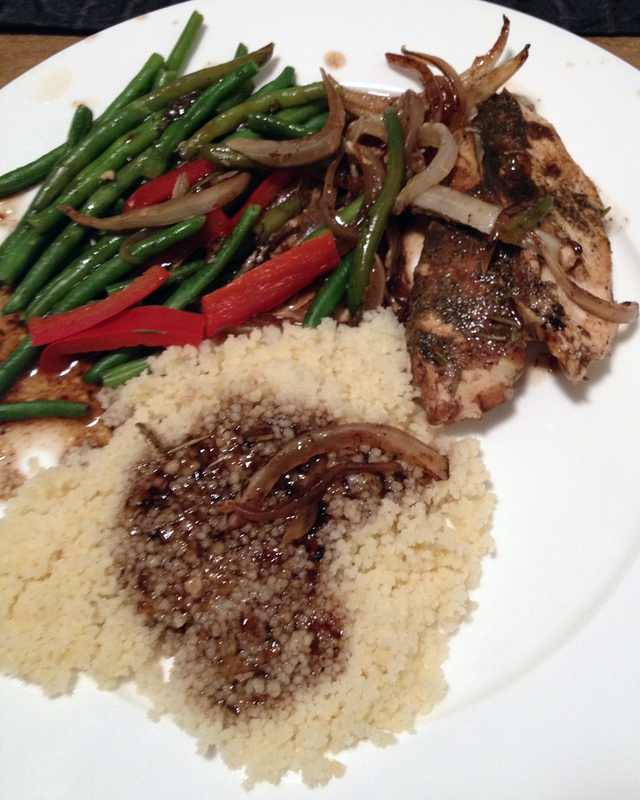 The Herbed Balsamic Chicken that kicked off week 3 was not as much of a hit. And it wasn’t the poor chicken’s fault. We had a thyme problem; we’ve always had a thyme problem. I have since rectified the situation and purchased crushed dried thyme instead of the ground thyme that we had, but when you sprinkle 1 tsp of ground thyme on anything, it’s a bit overwhelming. Nate dubbed it “mud chicken” because it looked like it had mud on it there was so much thyme. I thought it tasted good, but then what food looks like has never had anything to do with whether or not I will eat it. So use crushed thyme. I was also a little worried because of our previous very vinegary roast, but the chicken turned out well. It had a taste of balsamic, but it was not overwhelming. Mud Chicken Cooking – I also didn’t pour the liquid over the chicken, which might have helped thin out the thyme. Place onion in slow cooker, sprinkle with tapioca. 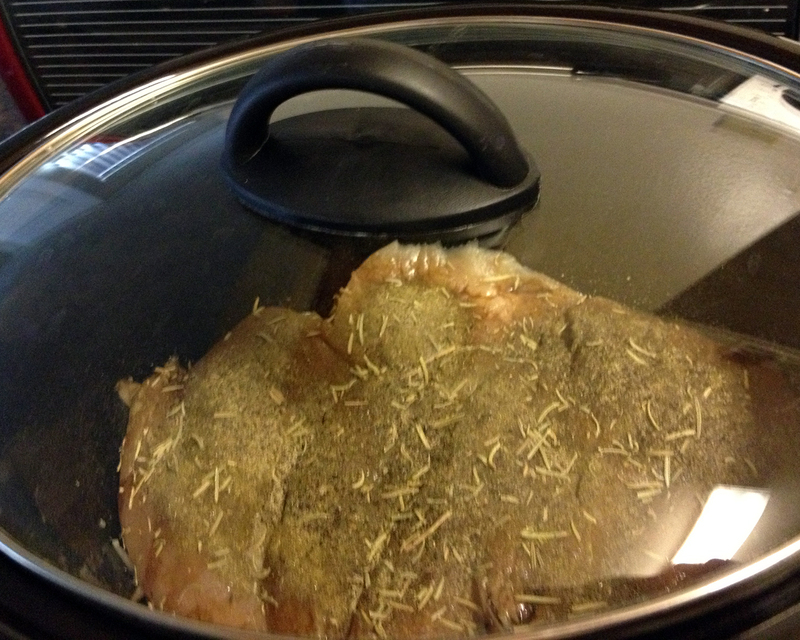 Top with chicken, sprinkle with rosemary, thyme, salt, and pepper. Pour vinegar and broth over chicken. Cook on low heat for 4 1/2 hours or high heat for 2 hours. Turn to high heat, add green beans and red sweet peppers, cook for 30 min. Brown meet in hot oil, drain fat, set aside. Combine mushrooms, green onions, garlic, oregano, salt, thyme, pepper, & bay leaf in slow cooker. Top with meat and pour broth and sherry over. Cook on low heat for 8-10 hours or high heat for 4-5 hours. Remove bay leaf, turn to high heat. In bowl combine sour cream, cold water, cornstarch and about 1 c. hot cooking liquid. Stir sour cream mixture into cooker. Cook for 30 min or until thickened. Sprinkle with parsley and serve. 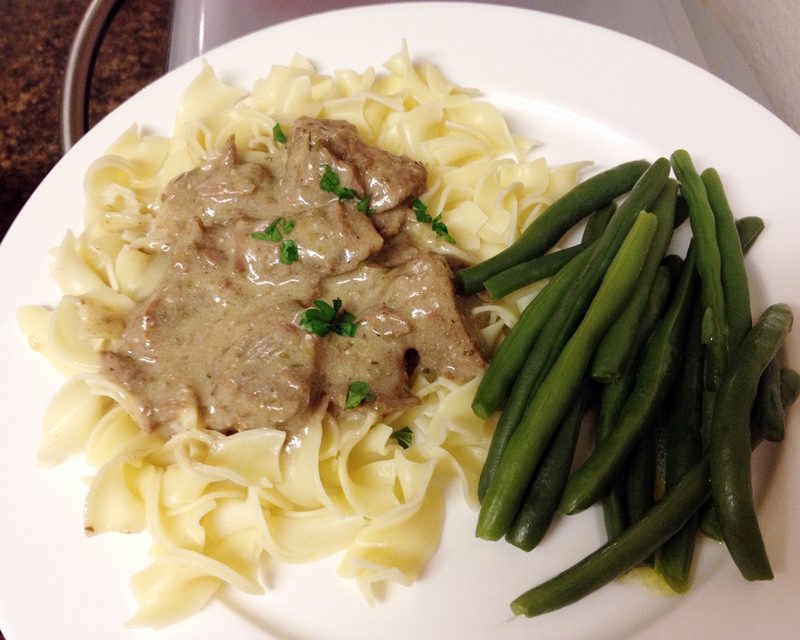 We served ours with wide curly egg noodles and green beans. And it was delicious. Only one week left of NoCoPoMo. And Nate picked the menu for the entire week. He was getting tired of my “trying new things.” Ah, it happens. When I signed on to November Crock Pot Month in the middle of October, I was worried that it would be way to warm for the hearty meals that I love the crock pot for. The stews and roasts I usually make don’t sound so wonderful when it’s over 90° during the day. But November has been decidedly cooler (hooray!) and, combined with my quest to find all things fall, it’s turning out to be a really good idea. In the past few days I’ve even pulled out my wool socks and thought about turing on the heat! It won’t last, though. It will be back in the mid-70s to low-80s soon. The idea of NoCoPoMo is to get people cooking and sharing recipes for homemade food. Since slow cookers are an easy way to make a warm, hearty meal, and we’re basically all overbooked and a bit crazed (especially at this time of year), sharing slow cooker recipes is a great way to make this happen. We’re supposed to make 1-2 meals a week and share our recipes. Since we’ve been in Arizona, I cook pretty much every day. But I remember the craziness of our lives less than a year ago and how much I relied on the crock pot (and also the restaurant…) to feed us. I started about a week early, but I really couldn’t help myself. I had discovered the apple display at the grocery store and came home with way too many apples. 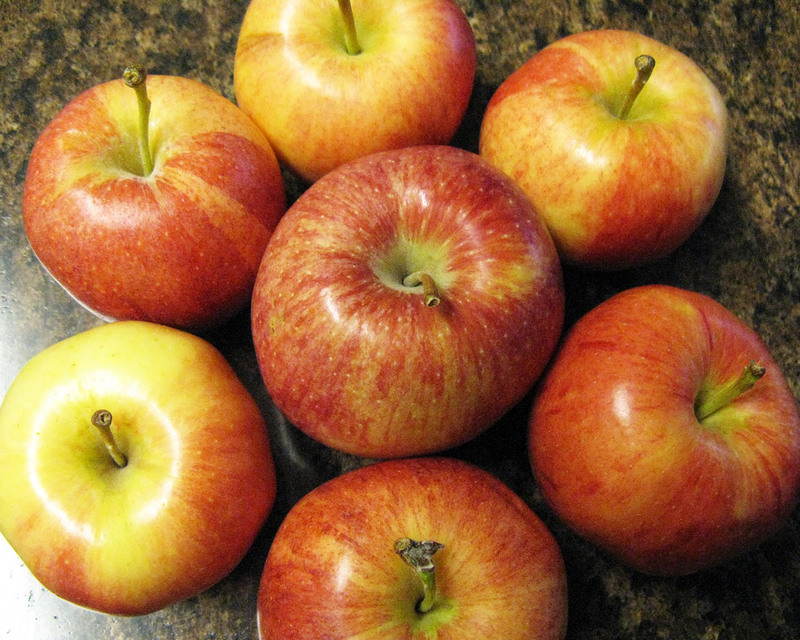 Apples that I only eat during the fall, and that Nate basically doesn’t like at all. 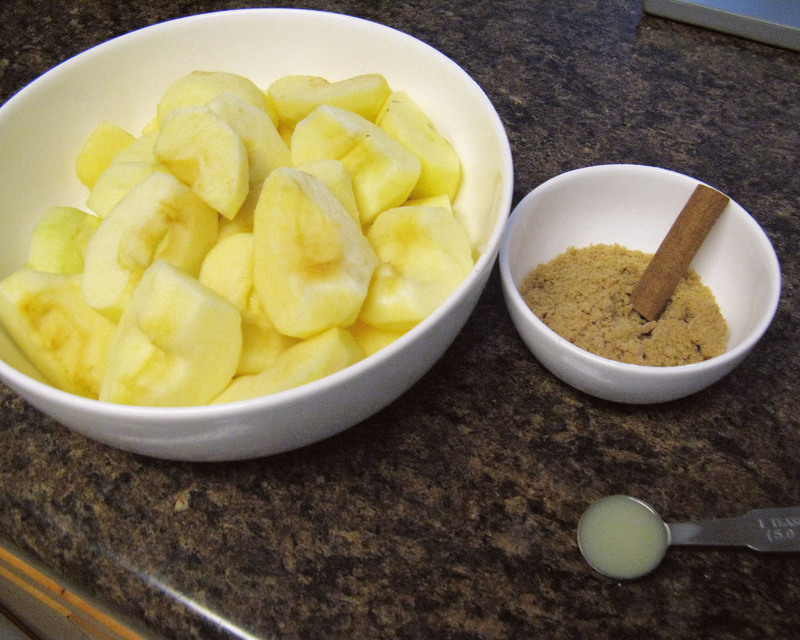 So I made applesauce. And it was delicious. Delicious when I ate it, first hot right out of the crock pot, then cold every morning on my oatmeal, and delicious smelling as it simmered all day long with cinnamon. I used this recipe minus the lemon peel. I did not have a lemon. I used bottled lemon juice. It was still delicious. Then! On the first of November, I kicked off NoCoPoMo with an Herbed Beef Roast from the Betty Crocker Cookbook! And it was a big fat flop. Boohiss. It happens. I’m not going to post the recipe, because I wouldn’t recommend it. But I will tell you what was wrong with it. It didn’t start off well, really. I had a smaller roast than was called for, which happens every time I cook because there are only two of us. I thought I could put it in our little crock pot (the one I have never used) but it was a bit too big. And it was way too small for the crock pot I usually use. So I threw in a bunch of vegetables to fill it up. The recipe calls for 1 cup of balsamic or red wine vinegar as the only liquid added to the roast. This seemed quite excessive to me, so I put in half vinegar and half beef broth. And I used red wine vinegar, because we have a ton of that. The whole roast tasted so much like vinegar that we had pucker lips while we were eating it and decided not to make it again. 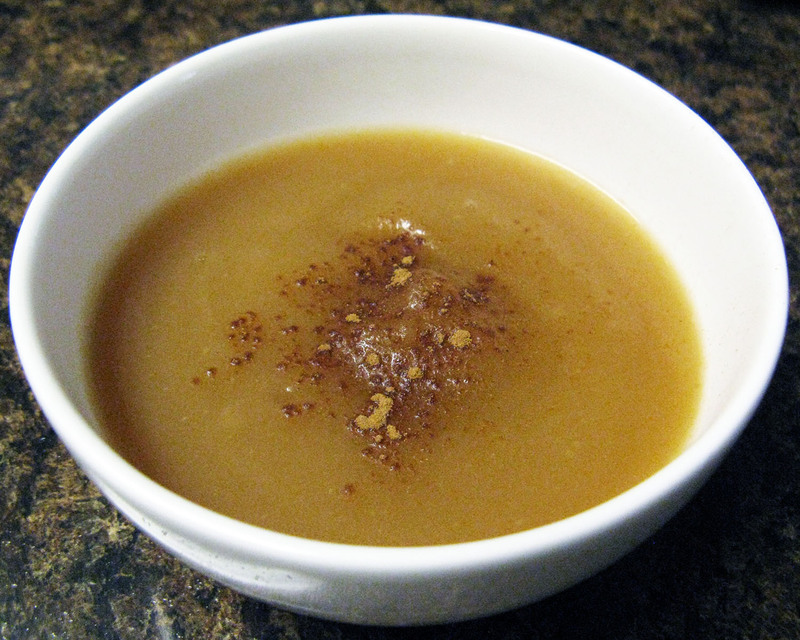 I think it would have been better with balsamic, and maybe even more beef broth and less vinegar. Oh well, we ate it and it was fine. Since that roast did not turn out so well, I tried another recipe. 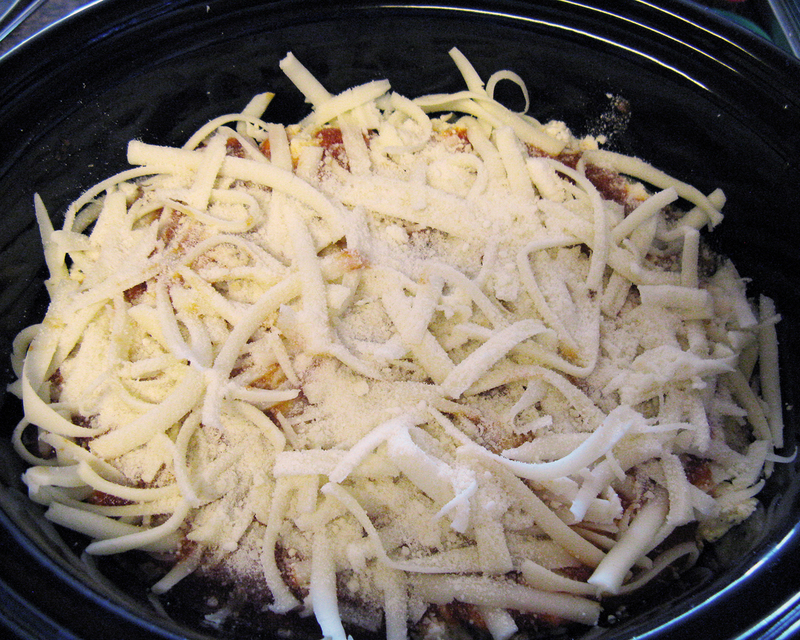 This one is from Better Homes and Gardens the Ultimate Slow Cooker Book. As usual, I didn’t follow the recipe exactly. Put meat in slow cooker; add thyme, cayenne pepper, tomatoes, French onion soup, and Worcestershire sauce. Cook on low for 8-9 hours or high for 4-4 1/2 hours. Turn to high and add peppers, onions, and rice. Cook for 30 min. I used fresh peppers and onions instead of frozen, and I didn’t use rice at all. I think I made potato pancakes instead. This one was pretty good, but it’s a bit of an onion overload if you don’t love onions. Have I mentioned how I have a habit of breaking slow cookers? One just stopped working in the middle of making a meal, and I broke the knob off this one approximately the 4th time I used it. Now it requires a wrench for operation, but it still works otherwise! Finally, this past weekend I made pulled pork. I made it on Saturday so we had to sit at home and smell it all day, but it was definitely worth it in the end. We actually had dinner at about 3pm when the pork was finished cooking because we couldn’t wait any longer! 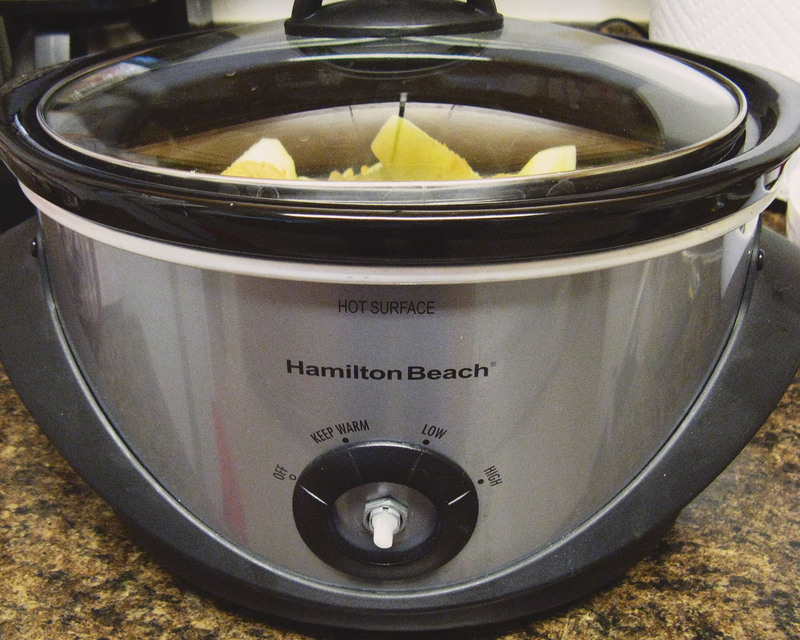 This recipe is also from Better Homes and Gardens the Ultimate Slow Cooker Book. And! I followed the recipe! Exactly! This never happens! Put pork in slow cooker, combine remaining ingredients and pour over pork. Cook on low for 10-11 hours or high for 5-6 hours. 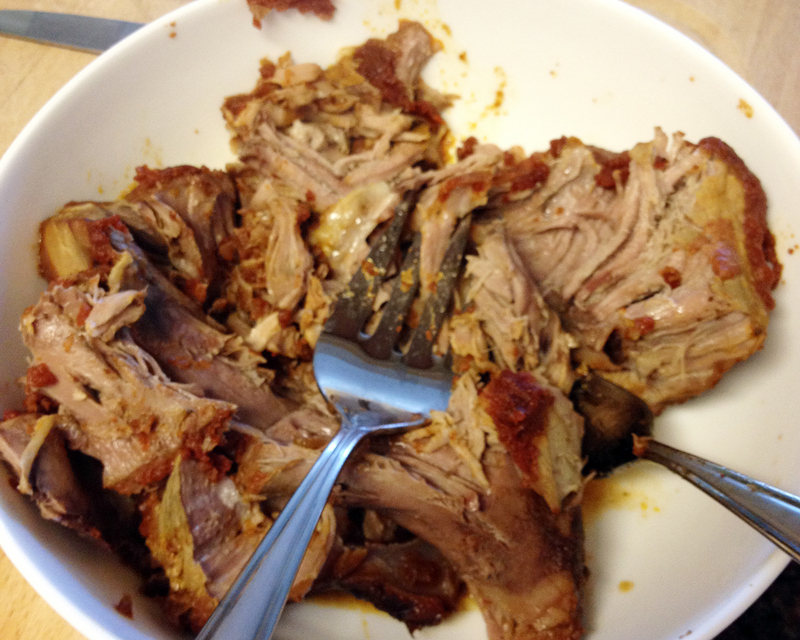 When finished, pull pork into shreds, return to crock pot, mix with sauce, enjoy. The pulled pork was really good, but I think we’d prefer the good old pour-bottle-of-your-favorite-barbeque-sauce-over-pork-and-cook method. 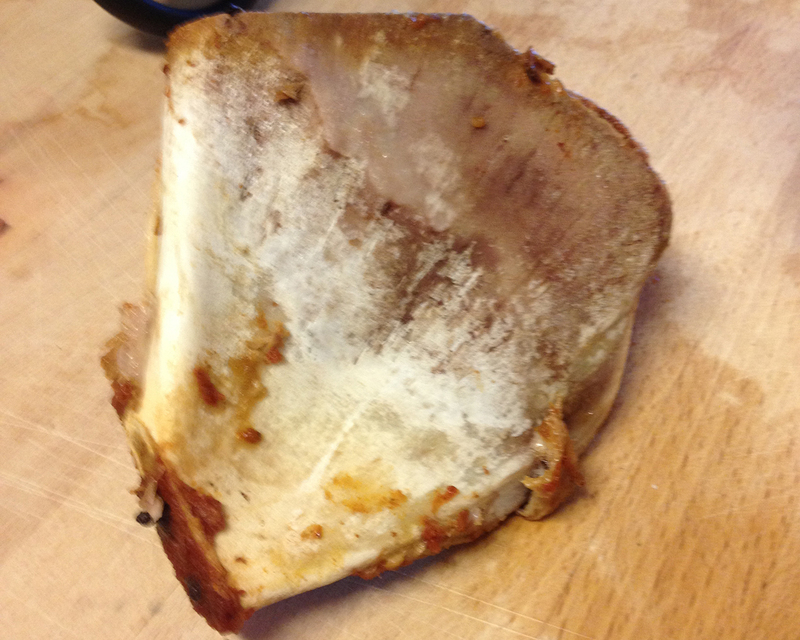 OK maybe I didn’t follow ALL the directions – I used a bone-in cut and all the meat fell right off! Isn’t that beautiful!